The Khamsin or Dust-Up Series uses large numbers of motorized vehicles to create drawings in the form of artificial dust or sand storms. 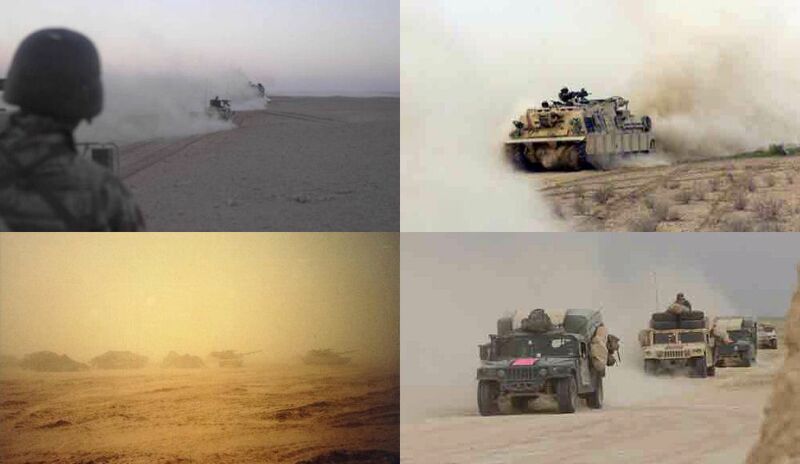 Large movements of human populations but more commonly any progress of numbers of vehicles across desert terrain, whether as a result of large motorsport competitions or military invasion by motorized columns, can produce artificial dust storms. 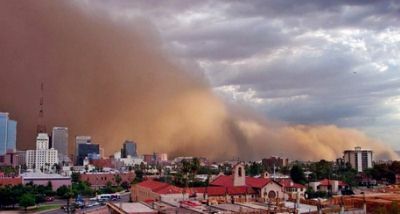 While these artificial dust storms do not even remotely rival the scale of the largest of such naturally occurring events, they have been being produced since the advent of motorized transport. These works bring attention to the increasing desertification of the earth and the existence of vast sand and dust storms which can traverse the major oceans, transferring tons of dust from Africa and Asia to the Americas and degrading air quality world-wide. Khamsin is the arabic word for the hot dry winds and the sand storms which are their result. The root work is the arabic word for "fifty" which is the number of days per year in which these storms are active in the Middle East. The alternate title literally describes the process of creating aerosol dust but is also vernacular for a fight. This series continues the objective of the Sky/Ground pieces in manipulating large scale visual processes in the environment which have been producing inadvertent markings as the result of human activity. These works involve conscious and deliberate composition using these hitherto unmediated marking techniques. The Khamsin pieces share with the Reentry Series an involvement with a class of markings which have resulting from an unusual duality of objectives. In the case of the Reentry Series, the form of the prior inadvertent markings, synthetic meteors, resulted from either the testing of nuclear weapons delivery systems, an obviously dark context, or as a result of space exploration, associated with the highest aspirations of humankind. In the case of the Khamsin Pieces, the vast majority of the prior inadvertent markings made with this media were the result of either armed military conflict, such as tank or armored infantry battles, or motorsports competitions, such as the Paris-Dakar Rallye or the Baja 500 and Baja 1000 Races. These dualities are not invoked ironically but do provide an unavoidable historical context, made even more poignant by the fact that in any particular instance of the prior markings, which side of the duality was the productive agent is often difficult if not impossible to determine from the purely visual evidence. The fact provides an inevitable cultural loading to the works which contributes to their spectacular nature. Again, the appropriation of some elements of The Spectacle is deemed appropriate to counteract the increasing marginalization of art and achieve the visibility required by the agit-prop objectives of the work. 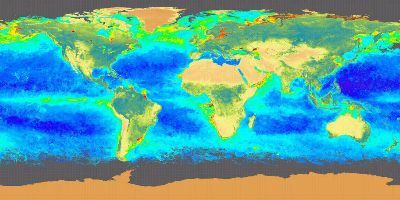 Some earth scientists believe that deserts are often man-made ecologies, resulting from a process known as desertification. Desertification occurs when the productivity of drought-prone land decreases because of a variety of factors including deforestation, overcultivation, drought, overgrazing, poor irrigation, and other practices. Most of these factors arise from human activity. Many of the problems associated with deforestation are linked to desertification. The United Nations Environment Program (UNEP) estimates that the world will lose one-third of its arable lands through desertification by the end of the century. About 1 million hectares in Asia are subject to desertification. The countries suffering most from desertification are Bangladesh, China and India. There are an estimated 1.7 million square kilometres of arid land in India and Pakistan. An estimated 2.6 million square kilometres of desert also occur in Australia, west Asia (Afghanistan, Islamic Republic of Iran, Pakistan) and other Asian countries. China's deserts are widely distributed throughout the northern districts and cover 13 per cent of its land area. Reportedly, China loses 120,000 hectares of farm and pasture land to drifting sand dunes each year. The result of this global desertification is the existence of what are now understood to be global dust storms, transporting tons of dust across oceans from continent to continent. Asia's desert areas are prone to soil erosion, as underground water tables are lowered by prolonged drought and by industrial and agricultural water use. 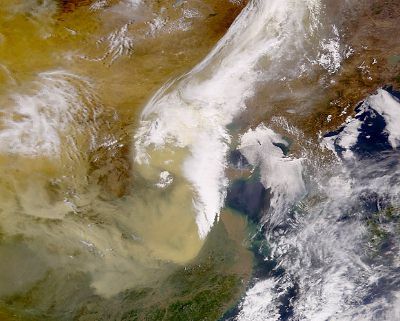 Heavy winds blowing eastward across the arid and sparsely vegetated surfaces of Mongolia and western China pick up large quantities of mustard-colored dust. Airborne dust clouds from the April 2001 storm blew across the Pacific Ocean and were carried as far as North America. Visibility in the US Southwest was visibly reduced in areas like the Grand Canyon and Glen Canyon National Recreation Area as a direct result of the Asian dust storm. "When the night came again it was black night, for the stars could not pierce the dust to get down. . . . In the morning the dust hung like fog, and the sun was as red as ripe new blood." North America has generated it's own share of dust storms in the past. A severe drought combined with poor soil conservation practices lead to extreme topsoil erosion, with devastating effects on the land in the Great Plains region of the U.S. during the 1930s Dust Bowl years. In May 1934, a cloud of topsoil from the Great Plains blanketed the eastern U.S. as far as 2,400 km (1,500 miles) away. In 1935, the U.S. established the Soil Conservation Service to promote good soil management practices. But according to some experts, this is not enough. Human-accelerated soil erosion continues to occur because much of the Great Plains is suited to moderate grazing rather than farming. In 1975, the Council of Agricultural Science and Technology warned that severe drought in the Great Plains could trigger another Dust Bowl. 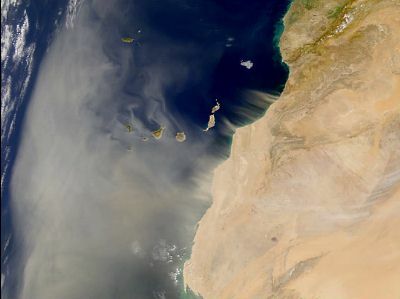 Dust storms and sand storms still occur with some regularity in the U.S. desert southwest. When the U.S. assault on Baghdad was halted by the worst sandstorm the region had seen in almost two decades some observers in the Arab world hailed it as evidence of God's displeasure with the invaders. Biblical references to whirlwinds and storms brought on by an angry God are legion, especially in the book of Job. In the book of Joel, the world is warned of "a day of darkness, and of gloominess, a day of clouds and whirlwinds" (2:2). The wind figures prominently in the Koran. Wind is the source of water in creation; out of wind comes rain. The wind is evoked as a corrective in the Koran. Chapter 46, verse 24 refers to "the wind which carries grievous punishment." "At the time of the battle of Badr, it was the small palm of the Holy Prophet's hand which threw a handful of dust towards the enemy and which rapidly developed into a sandstorm through the powers of God. 'It was not you who threw the dust but it was God who threw it'" (Anfal verse 18). Strong desert winds also feature prominently in Arabic poetry. Locations suitable for executing the Khamsin pieces will be scouted from the air throughout the Desert Southwest. The states of Arizona, Nevada, Utah, and New Mexico possess a number of dry lake beds, many of which are privately owned and could be leased for the few days required to mount the piece. As studies for the pieces, high resolution photographs will be taken of proposed sites and then computer graphic simulations of the pieces produced, most likely employing 3D particle field visualization techniques to accurately model the dust trails from the vehicles. Compositions will initially consist of sets of parallel or slightly diverging straight lines, originating from one or more complements of vehicles proceeding in similar directions. The number of vehicles is anticipated to be from ten to one hundred. As the studies progress, multiple units or complements will be choreographed in converging directions. Structurally, the point of origin for the visual configurations will be similar to the Reentry Pieces, but then made more elaborate by the possibility of having arced trajectories for the vehicles, something impossible with synthetic meteors. The initial siting in the Desert Southwestern US will take advantage of a large number of off-road racing competitors in the area who compete in numerous local events organized by such sanctioning bodies as SCORE. 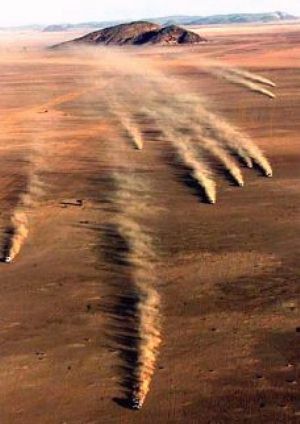 These competitors possess rugged vehicles capable of sufficiently high speeds over undeveloped terrain to produce dust clouds. These competitors will be approached to act as participants in the staging of these works. If the lakebed is sufficiently smooth to permit conventional road vehicles an alternative is to simply employ rental cars and volunteer drivers. Careful organization and staging of the events will be required for safety. The artist's experience in motorsports can be put to good service in this effort. Participants will need to be carefully briefed on what is expected of them and it may be determined that extensive rehearsals are required, initially at reduced speeds. Radio communication with each participant is a requirement but low-cost radios such as Citizen Band might be employed as an alternative to more expensive VHF hand-helds. The mounting of the work would be supervised from the air and extensive aerial and ground documentation would be produced as both video and still imagery. It is expected that pieces in the this series would be mounted in many of the great deserts of the world. In more remote locations securing participant vehicles might prove difficult. One solution for sites in North Africa might be to approach competitors in the Paris-Dakar Rallye to become participants at the completion of the event. 1) Reporting on the Environment: A Handbook for Journalists by Sharon M. Friedman and Kenneth A. Friedman, published by the Asian Forum of Environmental Journalists in cooperation with The United Nations Economic and Social Commission for Asia and the Pacific (ESCAP) Bangkok, Thailand, 1988; reprinted 1996.